Annoying as they may be, it is nice to see the old Heroes back. Because it's Halloween the folks at EA/Mythic have given us a new survival raid that will last until the 9th. Even better is that retrying only costs a single gem, which you can get by beating opponents in normal raids. Unfortunately you're going to need the help, because while individual waves are not at all hard your mana supply does not regenerate between rounds. And on the final wave there is an old friend just waiting to have a little... heart to heart over some not-so-fond memories. 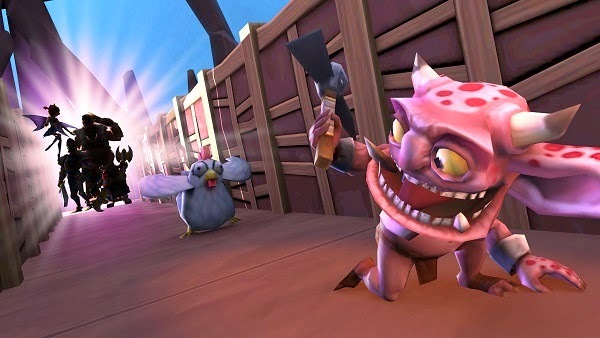 Funny, I remember one of my first posts about dungeon keeper mobile lamenting the lack of these guys. Here's hoping they stick around. Maybe they'll try integrating offline functions for when the server inevitably dies. Here's to hoping.